Each year in December, there are moments when I feel like my husband Ted is a regular Grinch compared to my Buddy the Elf. Take, for example, the much-anticipated Christmas tree trimming. Without fail, for ten years now, Ted has consistently pulled a Harry Houdini at what’s traditionally a group activity. Yep, he mysteriously escapes all involvement. While I’m busy stringing lights, hanging ornaments, and creating holiday memories, he’s holed up in a milk can somewhere, strategically avoiding all evergreen contact. You’d think he had a synthetic pine needle allergy. The thing is, when we first got married, I didn’t realize that Ted preferred life on snowy Mount Crumpit to citizenship in Whooville. Our first holiday season together we were too busy exchanging vows for me to see that this man to whom I was pledging my life and love didn’t share my enthusiasm for the holiday season. In fact, what made the disappointment more difficult later, is that I just assumed he did. After all, Christmas wedding equals holiday cheer, right? Turns out that what I’d interpreted as “cheer” that first year, had much more to do with me and our honeymoon in Paris than tinsel and gingerbread. While you won’t hear me complain that I trumped décor and dessert in Ted’s book, I wouldn’t have begrudged him if some of his joy had also been attributed to at least a little seasonal festivity. But it wasn’t. Nope, his lackluster attitude for holidays in general wasn’t something we covered in premarital counseling. Rather, it was something I came to discover with time. Something that, if I’d been more observant during our engagement, perhaps wouldn’t have come as such a shock our first Christmas stateside. After all, he was the guy who intentionally spent his last Thanksgiving as a single man in his condo, by himself, playing video games. That Christmas was hard for me. I’d grown up with a family who loved to celebrate together. Now here I was, living almost 1,000 miles away with a new husband who just really didn’t care. When my attempts to establish our own traditions weren’t met with much enthusiasm, I gave up. That year we ate a Mexican pizza on Christmas Eve. From freezer to preheated oven to paper plate. A regular fiesta. I’d love to tell you that Ted has evolved. That he’s magically come to love the holiday season over the years. While there are a lot of ways Ted has changed since we got married, his response to holidays isn’t one of them. Maybe you and your spouse are like Ted and me. It could be that one of you finds more excitement in the holiday season than the other. Perhaps you feel frustrated and discouraged that Christmas cheer isn’t something you share in equal measures. 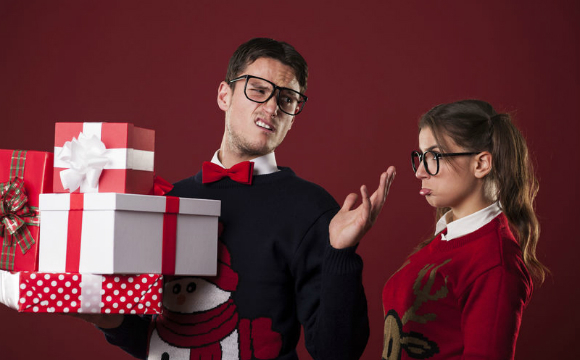 If so, I offer these two things I’m learning on how to navigate our differing attitudes when it comes to the holidays. I can’t force Ted to be as excited about Christmas as I am. Or New Year’s. Or even his birthday. I just can’t. There’s no amount of bribing that’s going to get him to decorate the tree with me. He simply doesn’t care. Okay, that’s not entirely true. This year, he did lug the box of plastic Christmas tree parts out of the basement. And he promised to hang lights on our front porch. Although, I’m pretty sure the lights thing is more peer pressure than anything else. After all, we wouldn’t want to be the only dark, unfestive house on the cul-de-sac, now would we? And the thing is, I know better than to use pressure or guilt to coerce Ted. You see, no amount of “pretty, pretty pleases” and extra pouty lips would give me what I want–which is genuine enthusiasm. Rather, they’d most likely have the opposite effect. You know, reluctant participation that does little to raise the cheer barometer in the room, ultimately leaving me further disappointed. So yeah, after my initial shock ten years ago, I backed off on trying to force Ted to embrace the holidays with equal excitement. Before you conclude that I’m fatalistic and have relinquished all hope of ever bringing Ted down from Mount Crumpit, let me share the second, and perhaps more important, thing I’m discovering. While I don’t pressure Ted to enjoy Christmas in the same way I do or even ask him to help decorate the tree anymore, I haven’t given up entirely. I’m far too persistent for that. What I have done is become more realistic in my efforts. Since I realize he isn’t ever going to be gung-ho-ho about celebrating, instead I look for small ways to make shared memories this time of year. Ways that are meaningful to both of us, not just me. For example, Ted will never love Hallmark’s long list of holiday movies, but like me, he loves theater. It’s a date night activity we both get excited about. For several years, we took this common interest and found a holiday event we could enjoy together: a Madrigal dinner. It was something that Ted eagerly anticipated as much as I did. It offered him a festivity to look forward to and get excited about near Christmas. Because we now live 1,400 miles away from that dinner, this year our theatrical outing may include A Christmas Carol performed at our local Shakespeare Tavern. In those moments when I feel like I’m married to the Grinch, I remind myself that apathy isn’t something Ted brings to every area of our marriage. While excitement for Christmas is something he still lacks, there are plenty of other things we can celebrate together with shared enthusiasm. And it just so happens that one of those things occurs on December 24th. You see, that Mexican pizza we ate that second Christmas Eve has become more than a humorous anecdote. It’s become a tradition we still practice and, yes, laugh about as we do. Sometimes we even whisper, “Felix Navidad” as we add Texas Pete’s to our already spicy main dish. This tradition of ours, it’s one I think Ted anticipates even more than I do. Maybe there is a glimmer of hope for Ted and Christmas after all.